Telling your parents that you’re gay, lesbian, bi and/or trans, is likely to be one of the most nerve-wracking conversations a teenager can ever have. While they may be relieved that they’ve gotten the secret off their chest, a teenager who’s decided to come out to their family may still harbour the fear of upsetting a loved one, or feel like their identity isn’t accepted. It’s a conversation that happens all the time, across the globe – and in the world of celebrities too. 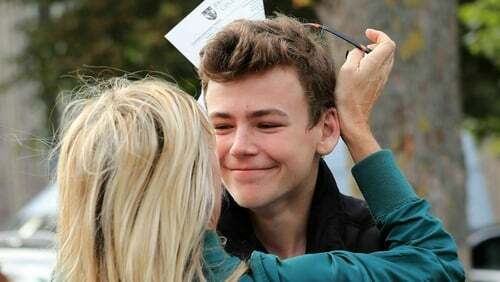 In fact, Zoe Ball’s son Woody recently revealed that his radio presenter mum felt confused when he first came out as bisexual to her. The 18-year-old spoke about his sexuality during an interview with Boys By Girls magazine, admitting that he’s liked both boys and girls for three years. "I told my mum and her first reaction was: ‘You can’t be, you like girls’," he told the publication. As a parent, like Ball, it’s understandable to have questions or concerns if your child has made the decision to come out to you, but how you initially react can make all the difference to a young person who is taking the right steps towards feeling comfortable with their sexuality. During the initial coming out conversation, it can be tempting to bombard your teen with questions, but Relate counsellor Simone Bose (relate.org.uk) advises you refrain from immediately jumping in with practicalities. Simply let your child lead the conversation and focus on making them feel accepted. "Try to stay calm and be aware that your child is probably doing something they’re scared of – it’s taken some courage for them to tell you," she says. "If you’re the parent of a child who has recently come out, it’s important to create a welcoming environment, where they feel able to talk about their sexual orientation and/or gender identity," says Kara Bird, information manager at Stonewall (stonewall.org.uk). "Young people will probably have thought about coming out for a long time beforehand, so understanding that this is a big moment and taking time to listen, rather than asking lots of questions, will help this process." Go slowly and and when you think the time is right, ask any questions you may have in a gentle, non-judgemental manner. Don’t expect them to have all the answers, though – their feelings might be just as confusing to them as they are to you. Although your teenager felt able to confide in you, it doesn’t mean they’re ready to let the rest of the world know about their sexuality. "It’s important to ask them who else they want to tell, as they may not want everyone in the family to know," says Bird. Let your teenager know that your door is open should they want to chat again, and if they’d like to speak to someone impartial, it might be helpful to offer to arrange counselling – but don’t enforce it. "It might be that they’d like talk through it with somebody who is knowledgeable in the area," says Bose. "Parents always want to know how best to support their children and make sure they’re happy," says Bird. "Luckily, there is a wealth of support available for young people growing up LGBT." She believes it’s a good idea to point your child in the direction of established groups that provide services for young people. The Stonewall website has a What’s In My Area resource that can help parents find local LGBT youth groups. In Ireland, BeLonG To, an organisation specifically reaching out to LGBT young people and their families, has a wealth of resources from information on youth and support groups for young people to support groups for their parents. Any parent who is looking for more ideas or advice can contact BeLonG To, a support network for lesbian, gay, bisexual and trans young people in Ireland, at www.belongto.org.